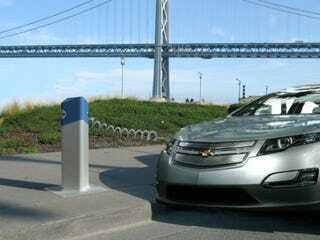 Most interest in the 2011 Chevy Volt has until now been directed at the battery and drivetrain. Now GM is looking to work with communities to make sure they're ready with plug-in power. Chevy Volt, Live And Unplugged! The GM "Plug-In-Ready" program is a plan to get the biggest target buying markets for the 2011 Volt ready to accept the car and maximize it's effectiveness as a plug-in. It's also part of the ongoing effort to work out how electricity providers commercialize the infrastructure needed to support plug-in hybrids and manage billing rates to the consumer. The first efforts of the program are centered on the metropolitan areas of San Francisco and Washington D.C. as well as areas identified as lousy with early adopters. This news comes on the heels of announcements last fall from cities and municipalities planning partnerships with Better Place, a plug in power post company. This kind of background information serves as a reminder this Volt thing is more than a project about just the car. GM has taken a big bite here and is chewing it's way through an awful lot of problems. Hopefully they don't choke on it. WASHINGTON - General Motors today outlined a comprehensive plan of action to help communities get ready for plug-in electric vehicles such as the upcoming Chevrolet Volt. GM announced details of the plan at the Washington Auto Show. "Collaborating with communities such as San Francisco and metropolitan areas such as Washington, D.C. - where there's already an interest in plug-in vehicles - is another important step toward raising customer awareness of the environmental and economic benefits of vehicles such as the Volt," said Ed Peper, GM North America vice president, Chevrolet. "Cities have an indispensable role in making plug-in vehicles successful," said San Francisco Mayor Gavin Newsom. "Here in San Francisco, we are acting now to make sure the charging infrastructure will be available to support these vehicles as soon as they are ready for sale, and we are working with other cities in the region to make the Bay Area a thriving market for electric transportation." Challenges that need to be addressed include consumer incentives to make this early technology more affordable; public and workplace charging infrastructure; consumer-friendly electricity rates and renewable electricity options; government and corporate vehicle purchases; supportive permitting and codes for vehicle charging; and other incentives such as high-occupancy-vehicle (HOV) lane access. GM is making great strides toward bringing the Volt from concept to the showroom. More than 30 prototype vehicles powered by lithium-ion battery packs are undergoing rigorous testing at GM's Proving Ground in Milford, Mich. In addition, last month at the North American International Auto Show in Detroit, GM announced it will manufacture the Volt battery packs in the United States. "The Chevy Volt is truly coming to life, but preparing the market for electric vehicles also requires capable partners from outside the auto industry," said Peper. "Momentum is building as governments, technology companies, communities and universities are increasingly working together to prepare the market for electric vehicles." * Last October, the federal government approved a $7,500 tax incentive for consumers of plug-in electric vehicles such as the Chevy Volt. * In November, the California cities of San Francisco, San Jose and Oakland announced a plan for plug-in vehicle infrastructure, incentives and enablers. * A new Michigan law expedites the development of advanced battery manufacturing and research capabilities in the state. * Working with the Electric Power Research Institute (EPRI) and a coalition of more than 40 utilities to solve challenges and accelerate the commercialization of plug-in electric vehicles. * Playing a lead role in helping to create Society of Automotive Engineers (SAE) standards for the vehicle charging interface. "We know plenty of work still remains, both within and outside of GM," said Peper. "But today's and other recent announcements underscore the comprehensive work being done to bring the Chevrolet Volt and other electrically driven vehicles to market - and they also highlight why we are so optimistic about the ultimate success of the Volt."